February 29, 2016, 12:25 PM · Would you like to premiere a brand-new violin concerto -- in six weeks? 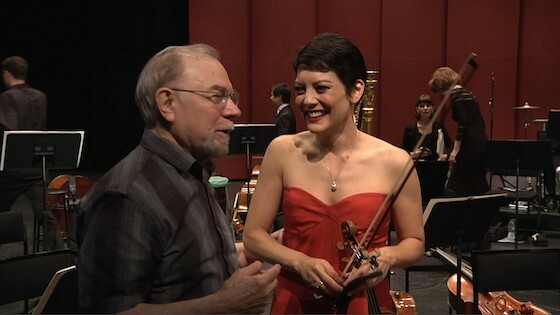 That's the question that conductor Gerard Schwarz asked Anne Akiko Meyers over the phone several years ago, when another violinist had pulled out at the last second from a performance of a new concerto by American composer Samuel Jones. Some of us might run in terror from the idea, but not Anne. "The concept of working with Schwarz and the All-Star Orchestra, while presenting the world premiere of Sam Jones' new violin concerto, in a record six weeks -- sounded like a challenge that was right up my alley," she told me. At the time she was in Aspen, preparing to premiere new works by Mason Bates ("The Pousse Cafe") and Somei Satoh ("Sange") in recital. Learning brand-new works is old hat for Anne, who has premiered concertos by Mason Bates, Somei Satoh, and Joseph Schwantner, as well as dozens of smaller compositions for violin/orchestra, piano and electronics. The composer of the new work, Samuel Jones, founded the Shepherd School of Music at Rice University and has been Composer in Residence of the Seattle Symphony since 1997. For Anne, his concerto sounds like a musical gem for violin, unearthed from 1880. "It sounds like a re-discovered Wieniawski Concerto with a touch of Rimsky-Korsakov and Mussorgsky," she said. "It sounds very neo-Romantic." Even in the short span of six weeks, "there were some revisions along the way, with some technical things we ironed out together," Anne said. "I was very grateful that Sam was amenable to the changes to make the concerto and his ideas shine as much as possible." She performed it on the 1741 Ex-Vieuxtemps Guarneri Del Gesu, with a Tourte bow. Have a listen -- what do you think? If you really like it, the sheet music is available, with piano reduction, through SheetMusicPlus. And about the All-Star Orchestra: it is a recording project created in 2014 by Schwarz, drawing on top players from major orchestras across the United States who perform for 20 high definition video cameras, without an audience, for PBS, the Khan Academy and other educational outlets. Some of the orchestras represented include Boston, Chicago, New York (Philharmonic and Metropolitan Opera), Philadelphia, Cleveland, Pittsburgh, San Francisco, New Jersey, Houston, Minnesota, Detroit, Seattle, Nashville, Oregon, Dallas, Florida, Utah, Cincinnati, the National Symphony, and more. This performance is from their second season, and David Kim, of the Philadelphia Orchestra was concertmaster. This performance, recorded in 2014, will be broadcast live tonight on PBS in Los Angeles and Syracuse and is also available on DVD. February 29, 2016 at 09:25 PM · AAM is incredible! March 1, 2016 at 03:42 PM · The hardest part for AAM must have been choosing which of her harem of priceless antique Italian violins to use for the performance. I do admire her playing though. March 1, 2016 at 04:41 PM · I like the piece. It creates a certain atmosphere and succeeds in keeping you there. The violin leads all the way through which is of course nice for use violin fanatics. The orchestra's role is largely limited to painting the scene for the solo violin. The middle part of the concerto I found it a little bit too long.